A SpaceX Falcon 9 rocket performs a "static fire" test on June 29, 2017, at Pad 39A at NASA's Kennedy Space Center in Florida. The rocket is scheduled to launch the Intelsat 35e satellite on July 2. The nine Merlin engines on the booster's first stage blazed up during a standard "static fire" test yesterday evening at historic Launch Complex 39A, part of NASA's Kennedy Space Center in Florida. If all goes according to plan, the Falcon 9 will lift off at 7:36 p.m. EDT (2336 GMT) Sunday (July 2) from Pad 39A, carrying the Intelsat 35e communications satellite to orbit in SpaceX's third launch in the span of 10 days. You can watch Sunday evening's launch live at SpaceX's website, or here at Space.com. The California-based company also successfully lofted the communications satellite BulgariaSat-1 on June 23 from Pad 39A. And SpaceX launched 10 spacecraft for the satellite-communications company Iridium on June 25, from Vandenberg Air Force Base in California. Sunday is shaping up to be a very busy day for SpaceX. That same morning, the company's robotic Dragon cargo capsule will detach from the International Space Station (ISS) after a one-month stay and make its way down to Earth for a soft splashdown in the Pacific Ocean. The current ISS trip is the second for that particular Dragon. 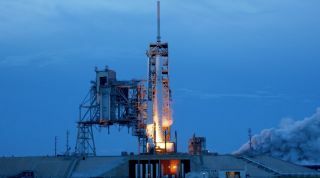 Such reuse is a priority for SpaceX and its billionaire founder and CEO, Elon Musk, as they aim to slash the cost of spaceflight by re-flying rockets and spacecraft. The Falcon 9 that launched BulgariaSat-1 had a reused Falcon 9 first stage, as did the rocket that lofted the SES-10 communications satellite on March 30.